Craving Italian food without all the carbs? 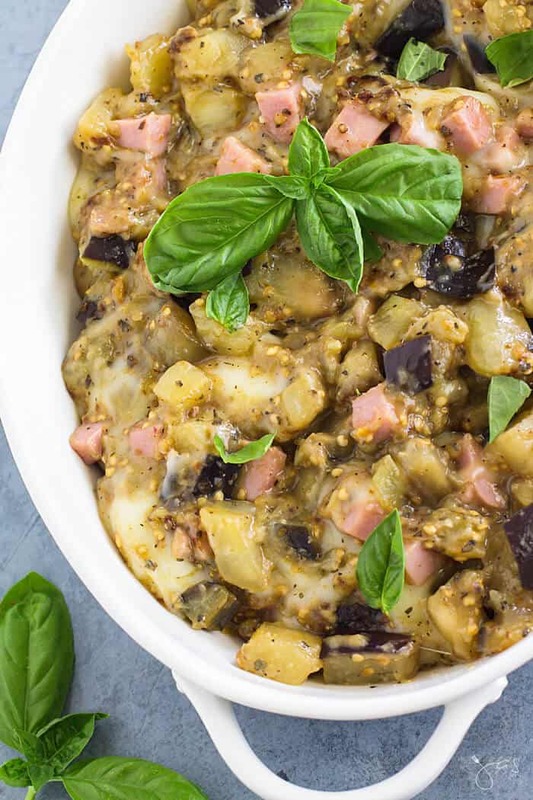 This melt-in-your-mouth Eggplant Pasticcio casserole has fresh flavors and is the perfect dish for exploring different tastes of this Mediterranean country. Gotta love easy taste travels! If you’re like my husband, you believe in the “eat your greens,” or “the greener the better,” pieces of nutrition advice. And, of course, you’re not wrong. Greens are great! And I’m pretty sure that my husband would eat green beans until the cows come home. Recently, however, I have tried taking on more of the “eat the rainbow” approach. “The greener, the better,” has now become “the more colors, the better.” A rainbow-colored diet of whole foods means that your body is being nourished with a wider range of vitamins, minerals, and antioxidants. The variety of colors that different vegetables possess are caused by the variety of phytonutrients that each contains. Each color provides distinct health benefits for our bodies, such as purple, which reduces inflammation and prevents aging. Usually, eggplant was a vegetable that I would ignore on the produce shelves. 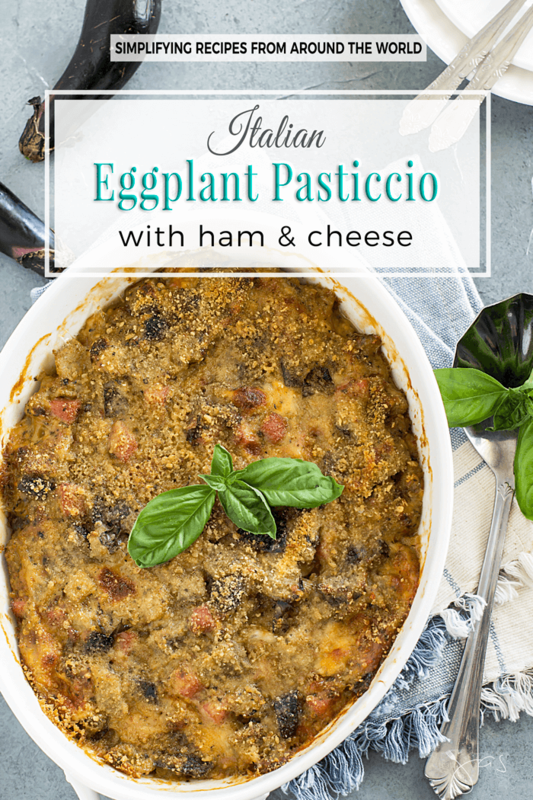 That changed today when I gave eggplant another chance and made this amazing, Italian eggplant recipe. When you’re looking for the perfect eggplants, your chance of finding one is best between July and October. You’ll want it to have firm, glossy skin, and although size varies, it should feel very dense in your hand. 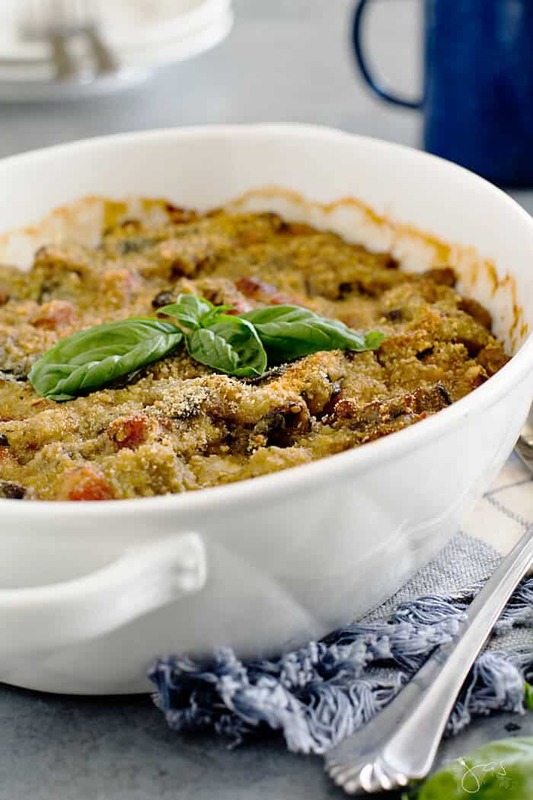 In this pasticcio dish, the eggplant practically melts in your mouth. 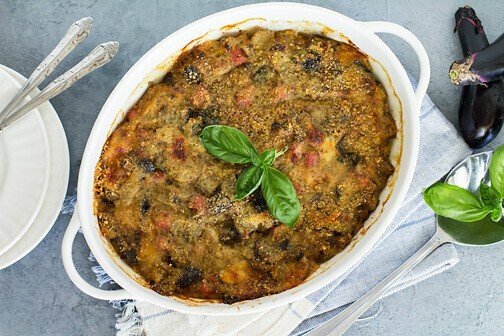 I served this yummy Italian eggplant pasticcio as a side dish for dinner, but it was so good I would rather eat it as a full meal on its own. 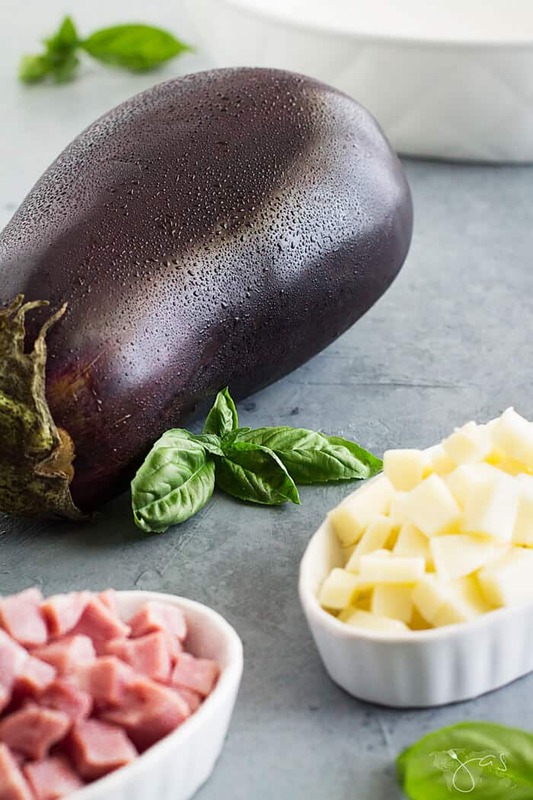 As you will soon discover, after my little tangent about eating the rainbow and all of the health benefits of doing so, I added a couple of factors to the eggplant that makes it… well, a little less healthy. Hehe. Who doesn’t love some gooey, melty cheese? Topped with crunchy breadcrumbs? Heck yeah, life is about balance! 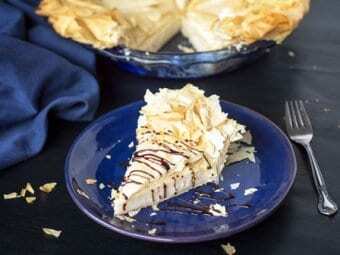 Plus, this recipe is totally worth it! If you prefer to make this as a vegetarian dish, simply leave out the ham. You can also simply switch out the ham if your taste buds are against using that type of meat. I will never advise against using breadcrumbs, though. 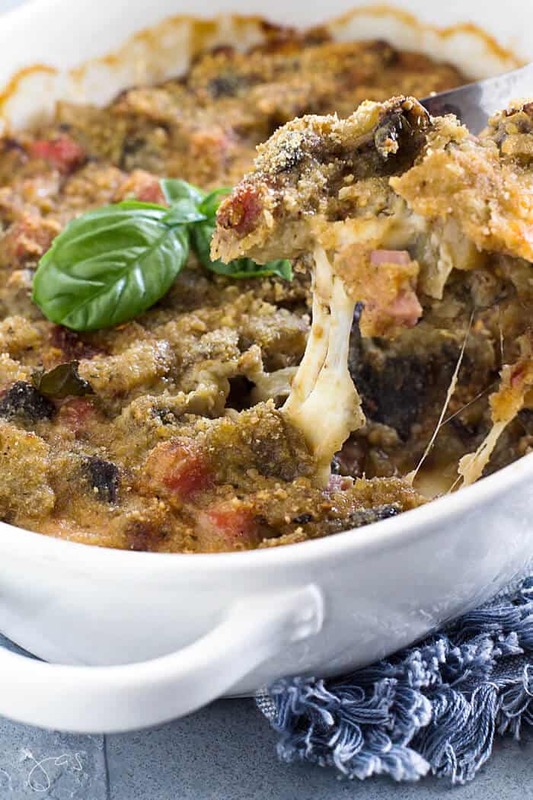 Italian family or not, I highly recommend that you bring this eggplant pasticcio dish to your next family or holiday gathering. You can prepare it the night before or morning of, refrigerate, and then put it into the oven early on at your function, so it’s hot and fresh when dinner comes around! Oh, and make sure you don’t get too hung up on the presentation of the dish; “pasticcio” literally translates to “mess.” It’s not what I would call a photogenic dish, but it is an absolutely delicious one. Once someone gets a taste of it, the rest will disappear out of the tray FAST! It’s definitely not one of those super-quick, under-30-minute meals that I constantly rave about getting to make on the weeknights, but it’s rave-worthy regardless. I would definitely categorize it as comfort food and soul food. Oh, I might be biased, because I LOVE leftovers, but I think it was even better the next day. You can use dried basil instead of fresh but reduce to 1 tablespoon or substitute with mint leaves if you prefer. Wash the eggplant(s) and cut into chunks. In a large cast iron or a non-stick skillet heat the olive oil over medium-high heat. Add the garlic and sauté on medium heat until fragrant, about 1 minute. Add eggplant and stir until they have absorbed the oil. 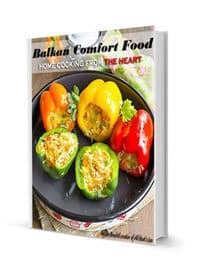 Reduce the heat, cover and simmer until eggplant is soft, about 10 minutes. 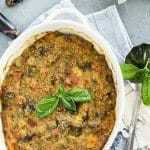 Remove from heat; add ham, cheese, basil, 2 tablespoons breadcrumbs, and 2 tablespoon Parmigiano Reggiano. Season with salt and pepper to taste. Beat the egg with a pinch of salt. Pour over eggplant mixture and fold gently to combine all ingredients. Grease a casserole dish and sprinkle with 1 tablespoon breadcrumbs. Transfer eggplant mixture to the dish. Mix remaining 1 tablespoon Parmigiano Reggiano and breadcrumbs and sprinkle on top of the eggplant mixture. Drizzle with olive oil and bake for 40-45 minutes or until golden brown. 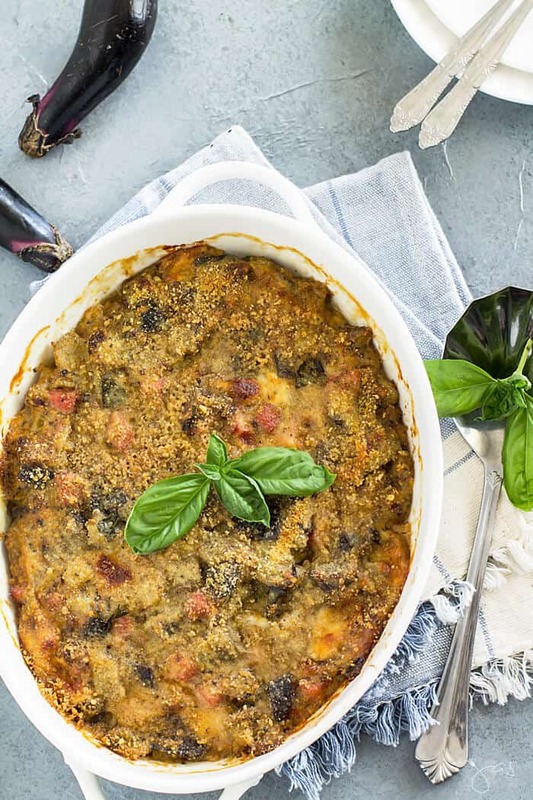 You will love this easy Italian eggplant pasticcio casserole, a delicious dish with Mediterranean flavors. Wow! This sounds soo delicious! We love eggplant but I’m not always sure what to do with it and often end up making the same few dishes. Definitely need to try this now. Jas the name sounds familiar but it is nothing like our Pastitsio. This one has totally different ingredients and it must be mouth watering with all that cheese. What a great casserole, this looks delicious! 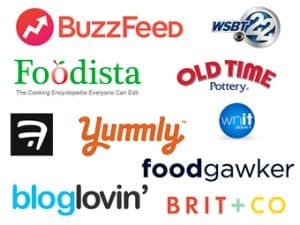 Thanks so much for sharing with us at Full Plate Thursday and sure hope you have a great week!